Sometimes you need a little bit of time to work on your social life and in the past week I did just that. I find that in the world we live in now people say “I speak to my friends all the time, pretty much everyday” and what they mean is “well I messaged them online and tagged them in something”. There is a very big difference to messaging someone through a phone and having a conversation with someone face to face. This week everyday I tried a different cafe that I’d never been to before and with a different friend and this is how it went. Home of Franziska is a cafe based in a beautiful neighbourhood in Buda. Its interior is an instagramers heaven with pastel colouring, flowers and delicious foods! I was lucky enough to be invited to attend the first Rising Tide meet up in Budapest which was held here. The coffee was good and the food matched it. 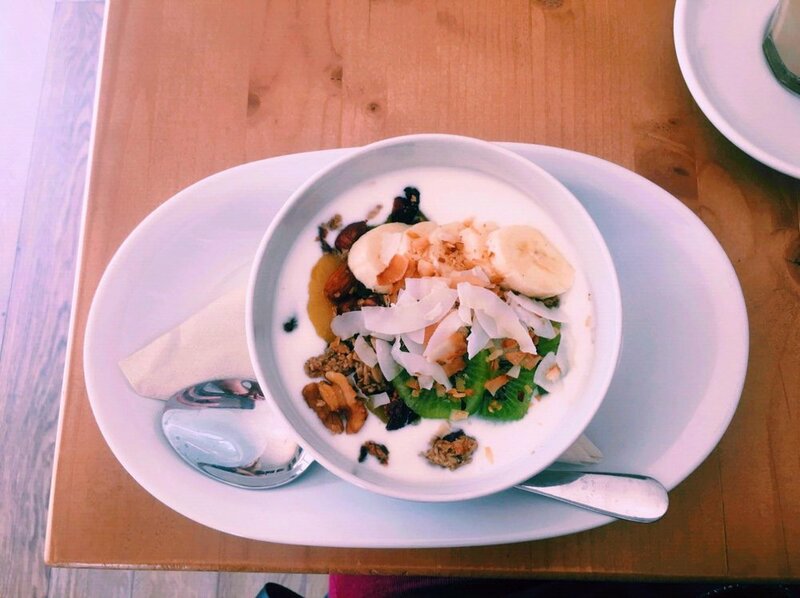 There was a wide selection of healthy options such as smoothie bowls and desserts made from all natural ingredients. It was such a bright and welcoming space and I also felt like it inspired creativity. I couldn’t say one bad thing about this cafe! I will be back soon to sit down and work there while enjoy the good food and the positive and creative atmosphere. I saw macaroons and I knew I had to come! I love everything french and I always think that no one can make macaroons better but boy was I wrong! Chez Dodo is a small cafe based in the heart of the city centre in Pest, as soon as I walked in the door I was greeted by a cabinet full of colourful and shimmering macaroons. 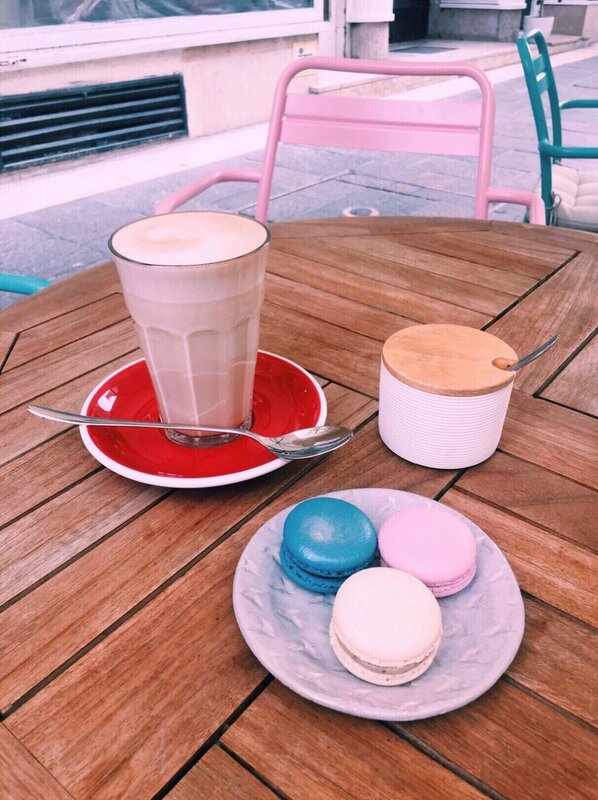 My friend and I had three macarons each and a coffee. The service was great and all of the staff were very accomodating to us. We sat outside in the afternoon sun and enjoyed our little treats. I had a Petit Prince, LouLou and Marie and they were all perfection! I think I will be making this my regular coffee date spot! I’m home!! My friend suggested that we meet here for coffee as she swears it is the best coffee in Budapest and she was not wrong. This little Brew Bar is tucked away down a street in Pest just off the main road. In the window you can see the coffee being filtered and the whole place has a rustic and urban feel to it. Unlike the freezing weather now it was a hot day and so I had an ice coffee which was made just the way I like it and that was followed by a Chai Latte with caffeine in it! Just as I was about to leave some Byron Bay cookies caught my eye so I took one for the walk home! I really enjoyed the atmosphere of the brew bar, it was very chilled and relaxed to catch up with a friend. I did hear that they have Lamingtons so I will be back trying to get my hands on one of those! I walk by this cafe all the time and have always wanted to try it! I ventured there for brunch with my friend not knowing much about the menu or vibe. The menu is short and sweet which is good for someone who is indecisive like me! We sat upstairs and it took a little while to be served but when we got our food there was no disappointment. My friend had a spinach and feta omelette and I had a granola with fresh fruit. They were both very yummy dishes along with our coffees. I also had a strawberry lemonade (which is a Hungarian summer thing and I’m obsessed) which was so fresh and a good morning drink. I spoke to some people who were working there from their laptops and was told that the wifi is very good, so I will be back to test that out as I’m so close! I met for Sunday brunch at Addicted to Caffeine and I was laughing all morning becasue of the baristas and other staff! They were so entertaining and made waking up early on a Sunday worth it! I first tried their coffee which was good, I then had a matcha tea with banana which was a cold drink…I’m addicted. Their food was also very yummy, I ate a camembert and ham toasted bagel and it hit the spot! The cafe had such a chilled out atmosphere and a relaxed vibe for a Sunday coffee. I think this might just be my new coffee spot….or matcha spot! This place was so cool and I never knew it existed! You can try different coffees from all around the world which is such a cool idea. I didn’t have too much time so I only tried one which was a Japanese latte which cherry and lychee and it was an interesting twist. The cafe is located in the city in Pest and because of this it is a very fast paced and busy environment which I must admit suits the style of the place! I wish I had time to try more but hey thats a good excuse for me to come back! I hope you enjoyed my week of cafes in Budapest and that you get to try some of them out in the future. I had a lot of fun drinking coffee on your behalf. I’m now sipping on a nice glass of wine watching the sunset.